Wood Finish matte is typically used over four coats of Epifanes Gloss Wood Finish. Suitable for both interior and exterior woods, this low gloss, matte finish varnish contains UV absorbers to provide long lasting, beautiful rich protection. A non-sanding solution specially formulated for oily woods like teak, Wood Finish matte is a one component varnish alternative based on urethane alkyd resins and tung oil. Container Size: 500 ml., 1000ml. Application: Brush, roller, conventional air spray, H.V.L.P. Temperature should be between 50 degrees F and 85 degrees F with the air humidity below 85 percent. Avoid varnishing in too much wind or sun. A rapid loss of solvents will occur under these conditions and will decrease the flowing ability. Add thinners up to the specified percentage to compensate for the faster release of solvents. Any existing finish much be intact, degreased and sanded prior to recoating. Before applying each coat, degrease the surface with Epifanes Spray Thinner or Denatured alcohol. Use a tack cloth to remove dust particles prior to application. Always stir Epifanes Wood Finish Matte before using. Failure to do so may result in an uneven or blotchy finish. Some settling of the formulation may occur upon long standing. We would advise using this as a finish coat over a good build up of a gloss varnish to give more layers of protection, especially from UV, but also adding more depth to the image you see. Matte and flat products like this will have a flattening agent that can develop an opacity if it is built up for numerous coats, with a white hue and less grain tonality. You could apply it directly to teak as a first coat. My understanding of the products which may not be accurate is you get better UV protection with the gloss product. I put several coats of gloss on and use the matte as the final coat. The end result is a matte finish on your project. Can you mix the matte with the gloss varnish to get a lower sheen than gloss for your final coat? Yes, this is a very common practice when trying to get a satin type sheen with products like this. Yes, this is actually pretty common when a customer desires a sheen that is between the gloss and matte. Stir the matte container very well before combining the two, and then it is a good idea to stir while applying also to ensure that it stays a consistent sheen. I never have but I don't see why not, it's the same stuff but I'll saythis: Things with flattening agent (MATTE) can get funny quick, flatteningagent doesn't want to stay in suspension so that's why they suggest to stirit constantly. I would suggest to start out by shaking or stirring thedaylights out of the low sheen and mix the two equally, I would use one ofthose quart mixing cups and be sure you keep a record, you might want to doit again and while you're using it keep it stirred, it will bottom outquicker than you think. I would use it on the last two or even threecoats, remember the two top coats will start to sacrifice in a couple ofyears. Is this recommended as a UV top coat over Mas low viscosity epoxy? This product should be sufficient as a UV stable coating for MAS Low Viscosity. You would want to wash first with water and mild soap incase there is any amine blush (they still recommend treating as though it has blush), sand lightly and apply. Personally, I would put at least a couple of coats of Epifanes varnish over the wood finish, which is good for a fast base. can you use more than I coat of matte finish on top of the gloss? Hi Tim, you can but what happens is every coat of matte that you apply, it reduces the clarity and vibrance of the wood because of the inherent opacity of the flattening agent. This is why it's recommended to do all build coats with a gloss finish product, and use the matte on the final coat whenever possible. You have good prices. However we got an order from you once with cans thatlooked as if someone beat them with a hammer. The box was immaculate. Isent an email which was ignored. (Great customer service, by the way) .Also...Bought some Epifanes, and in 1 month the varnished trim was bleedingthrough. Obviously a bad batch.Getting to the point where I REALLY do not want to do business with JD.Surprising that you would have the gall to send me an email like this afterI spent a lot of money with you, and your customer service ethics arenon-existent. The short answer in my experience is yes. We built a few exterior doorsand used 4-5 coats of gloss, then gave it a light sand and top coated itwith 2 coats of Matte (with a light sand in between). It really knockeddown the sheen effectively and consistently, and so far (almost one fullseason cycle in NY) it has held up great.Michael James Moran Woodworked Furniturewww.moranwoodworked.com < http://www.moranwoodworked.com/>Instagram @moranworkbench < https://www.instagram.com/moranworkbench/>Facebook Moran Woodworked FurnitureTwitter @mjmfurniture < http://twitter.com/@mjmfurniture>292 Near RoadGallatin, NY 12571DISCLAIMER / This message contains information which may be confidentialand/or privileged, and is intended only for the use of the addressee(s).Any use, disclosure or copying of this message or any part thereof byany person other than such addressee(s) is unauthorized and strictlyprohibited. If you have received this message in error, please notifythe sender by return e-mail and delete the message. Thank you for yourcooperation. You could but why? One is all you need, two or three gloss undercoat then matte ,works great ,have done many projects ,more matte doesn't improve the look. Yes. This coating is easy to work with. A light scuffing of the previous coat assures adherence of multiple coats. Sure,just be aware the more matte you apply the less clarity the finish will have. I would like to get as deep/rich look as possible. My goal was to apply 6-7 coats with Epifanes clear gloss, then apply a fine 1-2 coats with matte. Will I loose some of the richness and luster if I use Matte as a final coat? I did the same thing to my front door. I do not think the matte finish had a negative impact on the appearance of the door. That should be fine. Epifanes is a really good product. You may need to slightly thin it as it is very thick. I can't answer your question directly. However, I did 5-6 coats of gloss followed by 2 coats of rubbed effect finish and the result were stunning. Obviously it's not as much depth as gloss, but it looks as though it was many layers of a hand-rubbed oil finish. It turned out beautifully. No, it will still expand the richness if you use the clear gloss for the build coats and ideally just use the matte for the final one coat. It looks really nice if you can get it smooth and just do matte on the final coat. Hi Jude, this product will work to help preserve the color and appearance. Generally, building up with gloss leads to the most clear and true appearance when the final coat is matte finish, and depending on how much sun exposure your table will get, most customers will put on anywhere from 4-10 coats for protection. For interior use on a small piece, which has less shine, the matte varnish or the rubbed effect varnish? Thanks! I would say the Rubbed Effect Varnish for interior use. Is this food safe? Looking for a sealer for butcher block counter. The gloss finish usually builds up quicker, you don't have to use Gloss if you don't want to. yes you can. I put on gloss first because I didn't want 7 layers of matte. with some gloss under it, it is a little less matte. but if matte is what you're after, you don't need any gloss. I can't tell from the photo if you're using &quot;Wood Finish Matte&quot;. 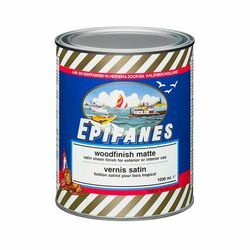 If not I recommend Epifanes,Wood Finish Matte for a nice dull finish. You should really apply two or three coats of the gloss first. Yes, but the finish will look milky. Recommend finishing with Gloss and the last coat in Satin for a beautiful result. You can only use one coat of the matte finish if you apply two coats it will be shiny. That is why if you apply two coats of gloss finish and then matte finish on top of that you will have good protection from the elements. I finished our new mahogany front door with 4 coats Epifanes gloss varnish thinning and applying as recommended by Epifanes. Then finished with two coats Epifanes matte finish with the first coat cut with 25% thinner and the final coat 5% thinner. The door looks so fantastic everyone who comes to the house comments on the door. Even the UPS guy, who has probably seen thousands of front doors, said "I never saw such a beautiful front door" and I had not even mentioned we had a new front door. You can't beat this stuff. The man who made the door is from Germany and he said, "In Germany this is all we use on wood doors". This stuff is more expensive than other varnishes, but it is worth every penny. It went on well (brushing on it handles different than epifanes high gloss but not bad just different) and dries nice and even.After 4 coats of high gloss this canoe looked so nice I almost didn't put this last finishing coat on the interior but I went ahead and I really like the toned down, rich look! I use Woodfinish Matte on furniture. I spray it, and it flows out beautifully, and dries to a lovely, even sheen. I highly recommend this product. Used on antique glider. It looks wonderful. Product flowes nicely and covers evenly and smooth.I put on the recomended coats and the finish looks like it was professionaly done! The product is excellent.The service and pricing at Jamestown Distributors < info@jamestowndistributors.com> is unsurpassed. I don't have anything to do with boats, but I do use this on outdoor wood signage in the Pacific NW, so it may as well be sitting in an ocean! I used this over the top of the Total Boat CPES, applied 4 coats of the matte on top and it is GORGEOUS! And I'm very comfortable handing these off and letting them hang in the elements for years to come. I used this finish over the top of penetrating epoxy. I used it on a butcher's block vanity top in a bathroom. I'm not a pro, but I've done a little bit of wood finishing. I agree with some comments about the difficulty of maintaining a wet edge. I brushed my first two coats on with a good quality brush, but still had lapping between passes. Between coats, I sanded with 320 grit paper. My final coat, I used a smooth finish foam roller. It left a slight orange peel finish, but it is even and looks very nice. I really like the dull luster and depth to the finish. Good have been to my shop/weather conditions but first coat applied dragged and tugged more than I would have liked. Second coat I found that if I brushed a second time, it almost worked out any marked and buffed the final finish to the matte finish I desired.